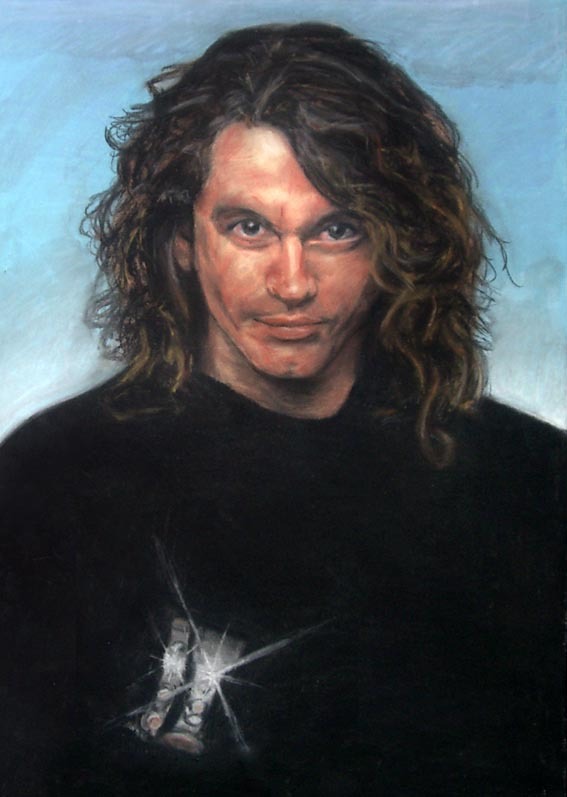 This portrait of late INXS singer Michael Hutchence was drawn over half a lifetime ago, back in 1988 when I was 15. It was done as my Year 10 high school major work, using chalk pastels. The original hung in my high school's reception area until I left in 1990. Originally you were supposed to see his hand wearing the bracelet, but after it didn't turn out so well, I followed the popular artist's mantra of 'When in doubt, black it out'. I can't believe you were this good when you were only 15. This drawing is amazing. I can't believe you did this when you were 15. Great details and use of colors. Amazing work. Tonia and cinredseth- Yeah 15, and I've kinda plateaued ever since. ;) Thanks guys. man, I can't even do anything that good now,at 23.